Diana Murphy founded Voice For Horses Rescue in November of 1999, She was a Cruelty Investigator with The Toledo Area Humane Society for 16 years. Has earned a National Award for Horse Proficiency thru the FFA, Horse Cruelty Investigations and have completed 40 hours of certification from the National Cruelty Investigators School, Level 1, through the University of Missouri Law Enforcement Training Institute. Has many certifications of Law enforcement thru the Criminal Justice Training Center as well as 14 years in Emergency Animal Medicine, She is a graduate of a 2-year Vocational Animal Care Program & FFA. as well as a member & responder with the Lucas County Chapter of DART (Disaster Animal Response Team). ﻿﻿﻿Sandra M Snell, DVM, CVA, Reiki Master was born with a love of horses that is imprinted into her DNA as much as any other neuropeptide. 4th generation Floridian, born and raised in St Petersburg, FL. She was able to manifest her first horse by age 12 by reading the horses for sale in the Sunday paper classified ads to her parents every week. Sandra has not been without at least one horse since then. In 1984 an A.A. degree was received from St Petersburg Junior College on a full 2 year scholarship for graduating within the top 5% at Pinellas Park High School. At the University of Florida she received BS in Animal Science in 1986 and DVM from their College of Veterinary Medicine in 1992. In between the two degrees, she lived and worked at Quail Roost Farm a Thoroughbred Farm in Ocala, Florida. Sandra’s Soul has the need to help loved ones. So she is addicted to learning ways and things that could help in the Healing process of man and beast. She started numerous holistic training all over the US in 1994 including Bach Flowers, NAET, homeopathy, herbs, essential oils, Reiki, Shaman (Native American Medicine Men/Women), chiropractic, and acupuncture, Sandra became a Certified Veterinary Acupuncturist from the Chi Institute, Redick, FL in 2001. She became a Reiki Master on 4/7/07 and Medicine Wheel Reiki Master 11/2012. Sandra was Ordained as a Minister of the Universal Life Church 10/2/09. This learning and helping has been a passion that has no end. Sandra’s path took a sharp northern turn in 1/1994 to land her in Sycamore, OH from south Florida. A week after closing on the house the belongings arrived and were piled into what is now the Clinic. The very next day, a blizzard came in and hit us with negative 27 degree wind chill. That was toughed out / faced head on just like every other obstacle. This also demonstrates perfect timing, because if the furniture was still on the truck with negative temperatures, the truck would have been South bond with everything. Sycamore Animal Hospital was open a year later. This has become HOME with hundreds of friends that have become FAMILY. On 4/24/2002 Mother of Coral Snell was added to the résumé. Coral inherited this horse love DNA. 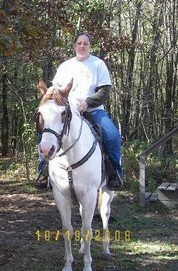 Coral found a horse in need of help on Voice for Horse website and shared with her Mom. Sandra called Diana Murphy and told her who she was and that she wanted/needed to help this poor horse even if it was not meant to be their horse. Sandra was so grateful Diana said yes. The horse was helped the day before it went to its new home. Coral and Sandra went back later and found Coral’s boy Skip and another sweet horse in need of help, Bubba Gump. Both of whom now also live here at Sycamore Animal Hospital.